I love your work, can we talk via email, I want to hire you for a project im working on. Just one question for you... How? As an Aries, I find this to be totally AWESOME. :3 Great artwork! Love it! It's super original! I have loved this piece for years now. I was wondering if you would mind if I got it tattooed on me. I have wanted to get it ever since I saw it. Oh my Good! I've soo been waiting for a good Aries draw. THIS IS IT! I'm gonna get this as a TATTOO! Definitely! But this is too cool! I've been searching a good drawing for one year now cause I wanna have my zodiac sign as a tattoo but never found something that I really felt it expresses the fiesty of an Aries. When I'll get it, I'll show it to you for sure. Thanks for the approval! OH MY GOD THAT IS AMAZING! i am an ARIES and i would love to have your permission to get that as a tattoo, if its cool with you if not thats fine to but i would really love this on my body. 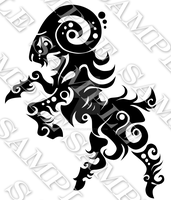 i was gonna get an ARIES tattoo any way but this one is way cooler that the one i was gonna get. so once again if its OK with you i would like to have this tattooed on my body. thanx for your answer. no prob. when i get it i will have pics took and sent to you. LOVE IT! Love your description too, I like that you mined the symbols for new substance. It shows in the clarity of your work. Thank you, I think every one de-cypher it for themselves hence the point of zodiac being a merely a representation. EXACTLY. I often think that astrology is more useful when it is interpreted metaphorically, as suggestions, rather than literal truth. So in love with this picture - especially with the small sign. Would like to have it on my neck. Hey thanks, yah I've seen this guy here and there, but who cares its for an old phone anyways. I want to get this as a tattoo..
aires most powerful sign in the zodiac ! I'm seriously considering this for a tattoo, I've been in love with it from the moment I first saw it. Your work is amazing. So intricate!! I love it. Aries Pride! WOO. how opposed are you to ppl getting these as tattoos? I am a taurus and an aries and your art has really made me want to represent that on my body. please let me know. Your Zodiac Signs are really awesome! Oh hell yes, this is so awesome! Wow... hard to believe someone can do this. Oh man, this is probably my favorite one (maybe because i am one) But their All soo awesome, nice work!